Dogs Luv Us and We Luv Them: I'm Gonna Wash That Itch Right Outta My Fur! 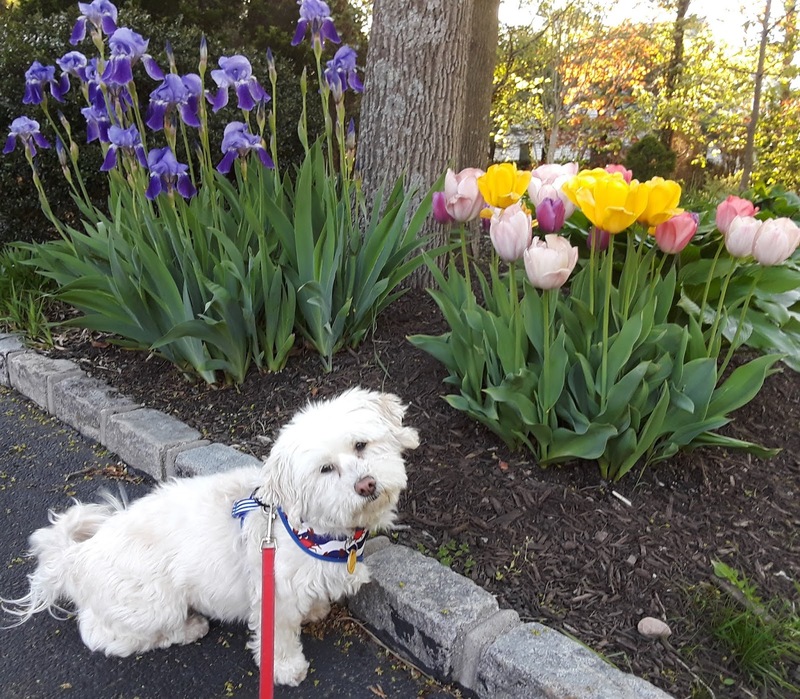 There is so much thick foliage, grasses and other flora here in the Northeast, allergies in pets are common. Recently Phoebe displayed some strange behavior that had me worried. One day I noticed that she was suddenly walking funny. She was kind of wobbly and rubbing against walls & furniture as she walked by. It looked like she might be losing her balance. I was afraid she could be experiencing some kind of neurological issue. It scared the heck out of me! I was trying to figure out what caused her wobbling and rubbing against things. My dogs never had allergies or health issues, other than occasional stomach upsets. With the warmer Spring weather the dogs have been spending lots more time outside. We also recently returned from a long road trip to the BlogPaws conference. I wasn't sure if Phoebe was having a serious medical issue or just a bad allergic reaction to something. I wondered if Phoebe's odd behavior was related to a serious health issue or if she was having some sort of allergic reaction. Perhaps she had been exposed to toxic pesticides or fertilizers on our walks or on potty breaks during the long road trip? Or, could it be as simple as seasonal allergies making her skin feel so much discomfort that she was rubbing up against things to relieve itchy skin? I decided to give her a good bath with a dog shampoo for allergies and itchy skin, and wait 24 hours to see if it made a difference. If she was having an allergic reaction to something on her skin, a good cleansing would help. If she continued with the wobbly walking and rubbing up against things, we would get her to the Vet right away. I had just received bottles of Zymox Itch Relief Shampoo and Conditioning Rinse for pets, to review on the blog. The timing couldn't have been more perfect! Zymox Pet Shampoo and Conditioning Rinse relieves pets itchy, allergy prone skin Naturally. I couldn't wait to try it. I was praying it was all Phoebe would need to stop her weird walking and rubbing against walls and furniture. This post is sponsored by Zymox® . 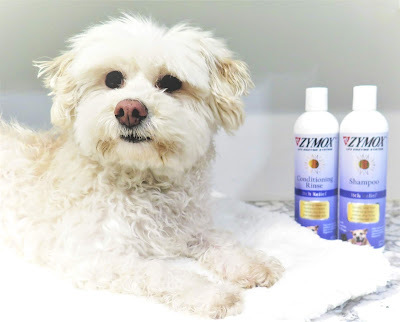 I am being compensated to help share information about Zymox Itch Relief Shampoo and Conditioning Rinse for Pets, but we only share information we feel is relevant to our readers. After bathing her just once with Zymox Itch Relief Shampoo and applying the Conditioning Rinse, Phoebe's wobbly walking and rubbing against things stopped, immediately! I can't tell you how relieved I was, and I could see Phoebe was relieved too! It was scary to see her acting so strange. I can only assume that she was having an allergic reaction to all the emerging trees, flowers, and pollen that come with Spring in the Northeast, or that she came in contact with a fertilizer or pesticide that irritated her skin. When humans have allergic reactions it usually effects the respiratory tract. In pets, however, allergy symptoms usually present themselves as external reactions on the Skin, Coat, Face, Ears or Paws. The below Info-Graphic indicates some of the more common symptoms of allergies in Dogs. Using their patented LP3 Enzyme System, a Natural anti-inflammatory antibiotic alternative, Zymox Itch Relief Shampoo and Conditioning Rinse provides natural inflammation relief caused by allergic reaction symptoms in dogs and cats. It's a great dog shampoo for itching skin due to allergies. Pet Allergies aren't just annoying, they can result in bacterial or fungal infections in the ears, or on the skin and paws. 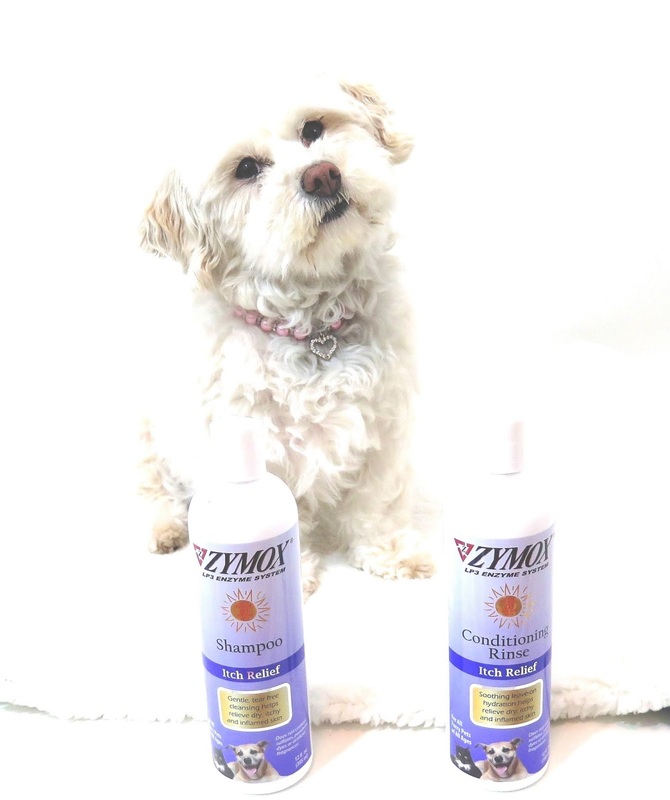 Zymox Shampoo and Conditioning Rinse is used a bit differently than most other pet shampoos and conditioners. Shampoo your dog and leave the Zymox shampoo in for 3 - 5 minutes. After rinsing the shampoo off, apply the conditioning rinse but DON'T rinse it off, leave the Conditioning Rinse on and just let it dry on your dog's fur. Just one cleansing with Zymox Shampoo and Conditioning Rinse and no more discomfort for Phoebe. What a relief! Zymox itch relief Pet Shampoo and Conditioner Rinse relieved Phoebe's itchy allergy skin! I'm being a lot more careful on our walks and outings now. I keep them out of thick grasses and wipe the dogs off with pet wipes each time they come back inside. It's a lot of work but I don't want them to be uncomfortable or start scratching frantically. Excessive scratching in dogs and other pets can break the skin which could lead to an infection. Zymox Pet Shampoo and Conditioning Rinse can be used to relieve itchy skin on both dogs and cats. It's gentle enough for use on puppies and kittens too! 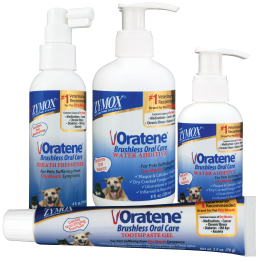 Zymox Oratene Brushless Pet Dental products. No teeth brushing required! Zymox Ear Cleaner to gently clean and sooth dirty ears! Do your pets suffer from allergies? Leave us a comment and tell us about it. My dog, Nelly, looks a lot like Phoebe and she suffers from different allergies. Summer is the worst for her, so I'll look into getting some of this for her. Poor Nelly! Give this a try, I especially like the conditioning rinse, it seemed to sooth Phoebe's skin so much. I'm going to buy some this week for her! Yes it is! I use their brushless (Yay, no brushing!) dental products for pets as well. I love their products. Me too, it really was so scary! I didn't know what the heck was wrong with her - she never had an issue like that before. I'm so relieved. That's fantastic and definitely perfect timing!! Jack does suffer from seasonal allergies and so far the only thing I have found that works is Apoquel. Luckily it's just for a short period of time. I guess it would be interesting to find out if these products could help him as well. Mr. N has a flea allergy that drives him (and us) crazy! I'm glad it wasn't anything serious with Phoebe and a good bath cleared up things. Aww I had this time of year with allergies and critters. So glad this worked well on the first try with Phoebe! I never had issues with allergens with my cats in the past but have dealt with fleas! Yikes! Ohh I'll have to check Zymox out! My pair don't have allergies often, but Roxy has been known to randomly break out in hives, so this would be great to have on hand! I would have been very concerned if I found one of mine wandering in such a way. This Zymox stuff sounds an absolute life saver that should be in every dog owners cupboard. Allergies are the worst. My older dog suffers from them. I bathe him once a week in the spring and summer as keeping him clean seems to really help reduce his allergy symptoms. I've never tried Zymox bath products but Zymox Otic is my go to product when my boys have any ear issues. I'll have to check out some of their other products sometime. Sophie has been very itchy lately. She got a bath just before her surgery, and I used an oatmeal shampoo that helped temporarily. She can't have a bath for another week at least, while her stitches heal. That shampoo looked interesting - I'll use it for her next bath. Our allergy season has been awful out here. Lots of people have said that their dogs are itchy. Carefully selected medicated bath can be a life-saver. Jasmine benefited from them too even though she was not an itchy dog--she was prone to skin infections. So glad to hear you've found a product that helped with Phoebe's reaction. I would recommend this to my mom, but she doesn't have the strength to bathe her dog anymore and he goes to the groomer (I'm not impressed). He has some terrible allergies, but the vet she sees doesn't seem concerned nor has she done any testing. Very frustrating! So far we've been lucky. No itch! No allergies. Phew!! I use organic and natural products made at home. I know what's in them that way. :) Also I don't bathe Monte as much as most seem to wash their dogs. He has a natural lovely scent (like butterscotch) and his fur brushes clean easily. I DO brush him 3-4 times a day. While I have not used the Zymox shampoo or conditioner I have used the Oratene products by them! LOVE them! Especially the water additive! It's such a great way to take care of our dogs oral health without them fighting us to do it! I am so glad that is what was causing Phoebe to walk like that! I bet it was a bit scary at first. Crazy how allergens can create all sorts of problems - for our pets and us! It's been a rough spring with that! That shampoo sounds amazing! We're so glad the shampoo worked for Phoebe and she's feeling better. We bet she's happy, too. She looks so cute in the sink and is such a good girl getting a bath. I'm so glad the Zymox shampoo worked for Phoebe and that she felt better after her bath. I bet it was so scary to see her walking like that. Very smart pet parent to figure out it was allergies! Washing allergens off is absolutely a great, safe way to keep allergies in check.